On Sunday, 23rd April, Merrow Village Bowls Club travelled to Liphook for their first match of the 2017/18 season. We were blessed with a reasonably fine day, some even had to remove their jackets and jumpers because of the warmth! The match was close-fought, with each of the four rinks frequently changing leaders. Eventually, Merrow managed to break through to win by eight points overall, also winning on three of the four rinks. The match was a very friendly affair, with plenty of banter among the players. Merrow were also pleased to welcome a new member, Nick, who played extremely well. Following the match, Liphook provided a welcome tea, with delicious home-made cakes. We look forward to entertaining Liphook at Merrow on 5th August. Sunday, St George’s Day, sees Merrow visit Liphook for our first match of the 2017/18 season. Here’s hoping for a good result. On Sunday, 16th April the green was officially opened by Tony Oldland, Club President, who made a brief speech before delivering the first bowl of the season. Several members then had informal matches to get a feel for the green following the Winter break. I’m pleased to report that the green played well, a tribute to all the hard work put in by members last Autumn. 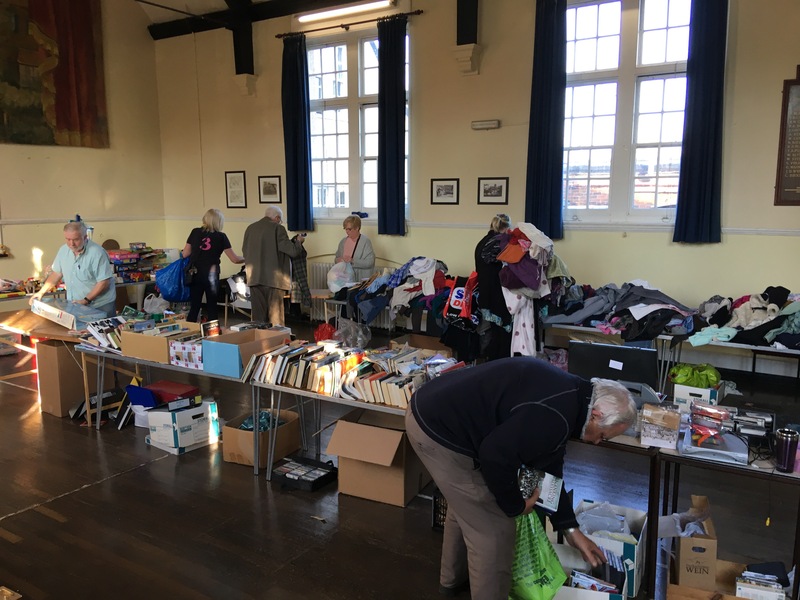 Saturday saw Merrow Village Bowls Club’s Spring jumble sale take place at the Village Hall. A good number of dealers arrived at 8:30 and purchased plenty of items, getting the sale off to a great start. However, that was just the calm before the storm. At 10am we opened up to the public and the fun really started. Each of our stalls was besieged by eager buyers and the morning passed in a flash, with much friendly banter between buyers and sellers. One lady had travelled twenty miles, saying “this is such a friendly place to come”. We look forward to the next sale in the Autumn.